Video art, though an exotic genre of art, is not merely a consequence of following the trail of western society. The emergence of video art in China or its acceptance by Chinese artists found a happy medium only after certain cultural conditions had fallen into place. Therefore, before we go into the topic of Chinese contemporary video art, I believe it is more necessary and meaningful to review the process of how video art appeared in China. The emergence of video art was first symbolized as an objection to the realistic creative methodology of utilitarianism. The peculiar fate of the Chinese nation in the last century has forced the Chinese society to view art in a way of utilitarianism (for example, the concept of content determining form and art for the sake of politics). Such thoughts were established at the Yenan Forum on Literature and Art by Mao Tse-tung in 1942, which were then maintained as the guidelines for the arts. The emergence of Chinese contemporary art initially challenged the guideline. During the 1980s, the work done by Chinese contemporary artists overturned the emphasis on the "socialist realism" of ideological propaganda. Specifically, what they were overturning was not a kind of artistic style; rather it was the cultural authority that this style represented. Therefore, the Chinese contemporary artists nearly repeated the overall art history of the west society within the decade. During the process, the style of conceptual art such as installation, performance and etc. began to appear. The political events of 1989 caused artists to realize that within their society there was a power that, at least temporarily, could not be contested, and that they really did not have the ability to carry out their own artistic convictions. Thus, low morale, cynicism and malaise began to spread. On one hand, due to the change of political climate at that time, the style of concept art was animadverted as decadent. All the channels to introduce western concept art were blocked; on the other hand, due to the long existence and education of social realism in China, artists began to take advantage of their familiar painting style to satirize the society in a tedious, boring and ridiculous way. They also adopted the popular commercial symbols to amuse the ruling ideology and formed cynical realism and political bop. Compared with 80s, no matter from the angle of cultural aspiration or the artists’ exploring directions, the early 90s was a time of withdrawing. While the cynical realism and political bop, though conservative to some degree regained a different fate in the 90s. Viewed from the angle of economy, 90s was a decade that Chinese market gradually opened to the west. In the past decade, numerous multi-national enterprises set up thousands of representative offices or branches in China. While the opening of China’s market appeared rather slow if compared with the wishes of western investors, multi national enterprises were still willing to spend great amount of money to operate their representative offices in China. People employed by such representative offices with little work to do, foreign ambassadors residing in Beijing and officious journalists from foreign media together formed the channel of the communication between Chinese contemporary art and its international counterpart. As a result of Chinese nationalization process in the last century, there was no economically independent middle class in China. Therefore, there was no chance for the art sustaining power to survive. The fanciers full of political discriminations formed the unique channel between the Chinese contemporary art and the outside world. China as the last socialist country began to draw interests from curious art tourists and collectors. Driven by commercial interests, galleries in the west began to go through such channels to introduce and sell Chinese contemporary art to the outside world. Such non-professional channels enabled Chinese art represented by cynicism and political pop to frequently appear in the west. In 1993, Chinese contemporary art, which features political bop and cynical realism, first revealed in Venice Biennial, which brought Chinese contemporary artists great amount of economic income and chances of international exhibition. In terms of the West, this form of artistic style, which ultimately points towards non-western ideology, established the label and standard for Chinese contemporary art, and initiated the process of cultural understanding and sharing on these foundations. 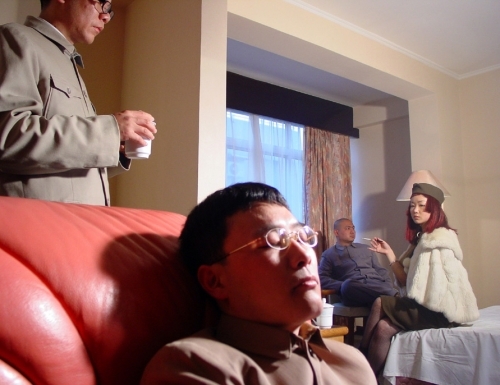 The success of cynical and political art encouraged even more young Chinese artists to embrace the status-giving image of “ political dissidents”. If in the past the artists had sensed the danger of art being controlled by politics, then now the cynical realism and political pop would make young artists feel that framed paintings, driven by commercial interests, would be imposed by the west post colonialism. Both above mentioned are based on the old style art medium and creative methodology (realism-utilitarianism). Under such background, the Chinese artists began to introduce and experiment on video art. Young artists desired to find a new art medium which will not be commercialized by west galleries and also poses a strong contrast to the official art. The medium will not only allow the existence of personalized feelings and languages but also be easy to use, spread and communicate. Under such circumstances, video art became their choice. In 1989, a German professor was invited to Chinese Central Academy of Fine art to give lectures. He brought 8-hour video art information, which included Gary Hill, Bill Violla and Matthew Barney. Works of those artists enlightened the two-generation artists like Zhang Peili and Qiu Zhijie to access to the complete video art information and realize the possibility of this medium, whereas they chose different ways. Zhang Peili is known as one of the early experimentalists of the Chinese contemporary art and also the first Chinese video artist. In 1989, he completed his first works. Generally speaking, Chinese artists in 80s were mostly concerned with grand narration of society and culture, which made them to apply the language style of logic and conceptualism. To be simple, Zhang’s early works was greatly influenced by Gary Hill and his genre. Such orientation was even more distinctive in his famous works “ uncertain pleasure”. They were going all out to distinguish video art with mass TV programs. Therefore he denied the existence of any traditional measures, sound effects or even the figuration of TV to appear in his works. Zhang’s style influenced many artists, for example, Zhu Jia’s bound video camera on a wheel to conduct shots; Han Xuan and Yang Zhenzhong’s repetition of the daily life. Similar while different to Zhang is one artist named Wang Gongxin, who resided in New York for a decade and was greatly influenced by Violla. The magnification of life subtlety resulted in unconventional experiences. Such means undoubtedly generated many works with strong visual impact. It is perhaps due to the different origin of Chinese and foreign video art. The origin of west video art originated from their rebellions to the system while in China the art derived from concerns on media. Just because of that, younger Chinese artists consider them as “standard video art” or “insipid tradition”. Representative video artist Qiu Zhijie has been concerned about the possibility of video technology and the aesthetic value it brings. For him, the route that Zhang followed was to worship the west video art as classics, while on the other hand he ignored the possibility that the new, inexpensive equipment and techniques have brought. For Qiu, the reasons why the early video art appeared insipid, on one hand is due to their anti-system belief, on the other hand due to financial and technical reasons. Therefore in the second Video art exhibition in 1997, the curator Wu Meichun wrote: ”the problem we are facing is not what the video art is, rather what we can do with video. It is still early to define the video art. Though it appears that a standard video art is coming into being, but it destined to be weary during its shaping. Video with an innate media is full of challenges, which is powerful and inexpensive. It is private and easy to duplicate and spread: it is both intuitive and imaginative. Under the instruction of such thoughts, video art began to appear three new development directions, such as documentary, narrative and interactive. In the mid-90s, the movie circle in China launched a large-scale campaign of “New Documentary Movement”. Director represented by Wu Wenguang emphasize the absence of photographer during shoot, and try to exhibit the real state of the objective revealed. Chinese New Documentary Movement is regarded as resistance to the grand narration of the governmental TV programs since the founding of the People’s Republic of China. Such orientation leads them no improvement in the documentary language and method. To be strict, what they created is “real documentary” rather than “New documentary”. While this movement interflowed with the video art in the art circle and combined a “new documentary art” beyond documentary. Wang Jianwei is the unique pioneer in this aspect. In his “Living Elsewhere”, he traced the life of four farmers in an unfinished villa, and disclosed that the function of the villa was never fulfilled. In his works, Wang created a very “nonprofessional” documentary in which some of the images stand still for as long as 8 minutes. While for him, all those are quite necessary because his works is to conduct review of phenomena rather than simple record. As the self-questioning of the video art, narration is brought about as an element. Video techniques enabled video art to share many achievements with the movie aesthetics—all the time disposal measures adopted by classical movies is applicable to video. Moreover, the time disposal in the video has more flexibility with the help of digital measures: various digital stunts created various relationships of time dimensions and greatly enriched the tradition movie language. The involvement of three-dimensioned animation makes every whim possible to become a visual reality. All these endowed many possibilities for younger artists. Representative artists in this field includes Yang Fudong, Jiang Zhi and etc. From these artists, they received more influence from movie aesthetics than the video art tradition. And moreover, they are seeking more chances to shoot film. While from them, we can see a possibility of applying video to conduct personal writings. Interaction actually derived from suspect to video art. Will video art finally be devoured by movie aesthetics and insipid tradition? Will Digital technology bring new aesthetic values except better image quality and convenience? Questioned by that, video installation was emphasized by artists as a “right time, right place” art. Because besides the attribution of video installation and video itself, it also includes the peculiarity of the installation more than the sum of the two. Telecasting of Multi-layer monitors or various reflected images distributed in pre-designed structures have formed a three-dimensional dramatic structure. The Chinese video art will develop into two distinguished video installations, which will focus on interior knowledge and interior experience respectively. Video installations focused on interior knowledge will appear in a specific scene. The video image will have some semantic connection with property and also the images will produce meanings. The property can be used to stand out the topic. For example, Wang Gongxin’s “Cradle” and Wang Jianwei’s “Screen”. In Wang’s “baby talk”, different facial expressions are revealed when playing with the baby. All the milk flows out from the mouth of the image and then circulates from other places. In the video installation ”Screen”, Wang discussed the cultural relationship of secret and disclosure and the truth. It is more like a visual version of “knowledge archaeology”. The indication of the two works are both wavering between vague and clear. The spot visual, audio and kinaesthesia experience sometimes transcend the original enactment of the author to complex and profuse imagination. Video installation focused on interior experience sometimes calculated the trace of the audiences’ physical movement in the interior structure of the installation, such as Qiu Zhijie’s “the present tense” and Chen Shaoxiong’s “Sight Adjustor”. Such works is based on anthropo-engineering, waiting the approaching of audiences from a certain location and route. Audiences’ bodies were pre-designed as a factor that will influence the installation composition and spot scene itself. The phenomena world established when the audiences are passing by was evoked as an interior experience rather than exterior knowledge. Video installation brings interaction to the agenda and artists try to ascertain the possibility of the video art through the pursuit of interaction. While that is more like a bitter choice. The more you seek for interaction, the more you suspect the spaces that the video art is able to provide. Therefore many artists began to seek for other interactive mode beyond the video installation. Artists focused on interior experience began to abandon video art and hope to seek the possibilities provided by new technology. More technical and more interactive multi media art then appeared. Artists focused on knowledge try to seek spot and social interaction by breaking the media. In 1999, Wu Ershan together with installation artists, jazz singers, and modern dancers completed “evolved knight”. If Wu Ershan’s involvement was not spontaneous but incidental, Wang Jianwei adopted a more active manner. He invited video artist, puppet players and performance artists to complete the play “Screen” derived from. In this works, the overall stage was a magnificent interactive work synchronized video, installation and performance. Through the development of video art in China, we can see that a new era is approaching. The west video art originated from their rebellion to the system while in China the video art derived from their concern on media. The professionalising of video art was strengthened in the west society since the involvement of foundations since 1968. In the west, people isolated video art with movie, TV and photography and brought it to galleries. It leaded to the combination of video and installation. During this process, video art turned from criticism of informational culture to the combination of social thoughts, which in return bring the validity of the video art itself. It is the duty of video art to criticize the informational culture while that is not all. Personalized manual contemporary art cannot dialogize the commercialized informational media substantially and nor can it rein it. Judging through video art practice before 1968, we will see clearly that the relationship of video art and mass media is like that of a strong fly and a fly flap. Chinese artists like all the other artists in the word begin to realize that they can only find their own territories and manners beyond the scope of the mass media. Pursuit of interaction is a forever dream of contemporary art. While we also witness that during the pursuit of interaction, like all the other artists around the world, some of Chinese artists lost their confidence on the media and finally abandon the media itself and turned to multimedia art, which is more technical and more interactive. Here, I am not saying that I object the emergence and existence of multimedia art, on the contrary, I am so confident about the future of the multimedia. While the reality of Chinese video art makes me ponder: The video art turned from criticism of information culture to the combination with the social thoughts in order to assure the validity of the video art itself. Is it the time to connect video art with movie, TV, photography and a lot more? For Chinese video art, it may be the time to choose. Do we value the video as one kind of media or one kind of culture? Because different choice will result in evolution and multi-polarity, the two completely different results.